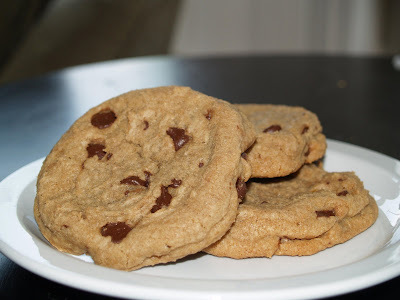 Frederick Foodie: The Cookies are Here! The Cookies are Here! That's right -- finally! Chippa Chippa Bloem Bloem Chocolate Chip Cookies are ready to sell. Yay! It's been a long few months getting these tasty bits of sweet deliciousness ready for market, but ready they are, and I couldn't be happier. For years folks have begged me to sell these cookies and I'm thrilled to do it now. No preservatives, nothing artificial; just pure butter, sugar, eggs, and vanilla. Whoo baby -- don't forget the chocolate chips! Want to see what they look like? You can also visit our homepage at http://www.kitchenstudiofrederick.com/ and click on the Chippa Chippa Bloem Bloem icon on the lower left portion of the page. These cookies are to good! Congrats!! Even if it is bathing suit season, I have to splurge on these cookies. They are sooooo good. Love these cookies! Congrats on getting them to market. Holy crap, those things are good. My husband and son gave them two chocolate-and-butter-smeared thumbs up, too!